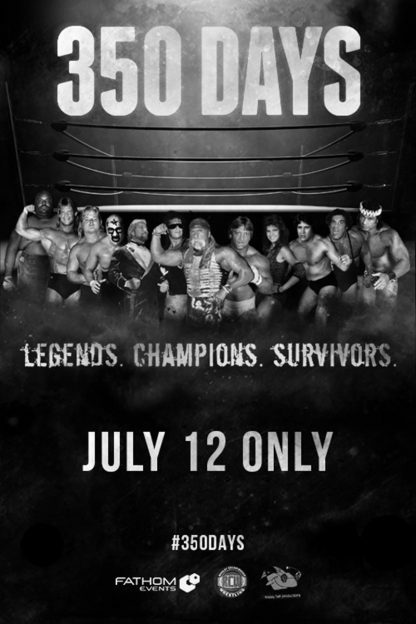 Pro wrestling fans have a “must-see” one-night event coming this summer as “350 Days” hits movie theaters nationwide this July 12. Starring former world champions Bret Hart and “Superstar” Billy Graham, the documentary provides a behind-the-scenes look at the grueling life they led on the road and the effect that lifestyle had on their marriages, family, physical and mental health. Featuring Greg Valentine, Tito Santana, Paul “Mr. Wonderful” Orndorff, Abdullah The Butcher, Wendi Richter, Bill Eadie, Nikolai Volkoff, Lanny Poffo, Stan Hansen, Angelo Mosca, Lex Luger, and more, the event also includes some of the last interviews ever done with George “The Animal” Steele, Jimmy “Superfly” Snuka, Ox Baker, The Wolfman, “Pretty Boy” Larry Sharpe, Don Fargo, and 99-year-old Angelo Savoldi. In addition to the documentary, this special one-night event will also present an exclusive introduction and interview with legendary wrestling manager JJ Dillon of The Four Horsemen to discuss the impact of the film and the current state of professional wrestling. Tickets for “350 Days” can be purchased at www.FathomEvents.com or participating box offices. Fathom Events, Rivalry Championship Wrestling and Happy Fish Productions present “350 Days” in nearly 450 U.S. cinemas for one night on Thursday, July 12 at 7:00 p.m. local time, through Fathom’s Digital Broadcast Network (DBN). For a complete list of participating theaters, visit the Fathom Events website (theaters and participants are subject to change).